All of us want to be popular among our family, peers and teachers, but very few of us know the simple tips which make us better-liked than others. We usually look up with admiration to people who are more popular than us and sometimes even envy them. It may interest you to know that we only have to follow some simple rules to gain popularity. Read and follow this simple guide to popularity and gain admiration within your social circle in no time. Generally, people who have a high graph of popularity are quick to share their blessings with their acquaintances. Whether it is a book, a gadget or a meal, they like to share their belongings with people around them and even happily give these things away, whether as a gift or a loan. meal, they like to share their belongings with people around them and even happily give these things away, whether as a gift or a loan. Popular people also love to share their joys and sorrows with friends and family. They are sympathetic when they find their friends in a problem and always try to be first to congratulate others in their moments of joy. They are quick to show people in their circle that they are an important part of their lives. Caring for people around us endears us to their hearts. A kind word, a sincere advice and a helping hand in difficult times, and sometimes even a gesture as simple as offering to carry someone’s load, are small acts which have far-reaching effects. Try to visit the aged in your family, especially when they are not well or at least call them from time to time. These small acts will make a special place for you in their hearts. Always remember that a soft voice, which expresses a logical view, is more effective than a loud one. Soft-spoken people are usually popular as everyone feels more comfortable in talking to them. Being polite is the easiest way to win over someone. It may be holding the door for the person who enters a room or car, offering your seat to an elderly person who cannot find a place in a bus or standing up when someone older than you enters the room. These are endearing gestures, which people do not forget easily. Always try to be the first to greet friends when you meet them. Take interest in their activities and ask simple questions to show that you give importance to them. Listen politely and never interrupt someone when they are speaking. Always wait for your turn when you are in a discussion. Remember, ‘Thank you’, ‘please’ and ‘sorry’ are magic words which are a mark of politeness and good upbringing. Using these words habitually will add to your popularity. Most of us seem to be in love with our own voice. Instead of listening attentively to what our friends or peers have to say, we like to speak non-stop without caring whether people around us are interested in what we are talking about or not! Most of the times, it is better to take interest in what people around us are discussing. When we listen with interest, we are bound to gain knowledge and learn to perceive things with an angle different from ours. When friends are talking about their problems, only if we listen attentively, we will understand their troubles better and be able to give out a word of advice where needed. While discussing a current issue or a hot topic, we usually get over excited and raise our voices to try to drown out those around us. Always remember that a soft voice, which expresses a logical view, is more effective than a loud one. Soft-spoken people are usually popular as everyone feels more comfortable in talking to them. 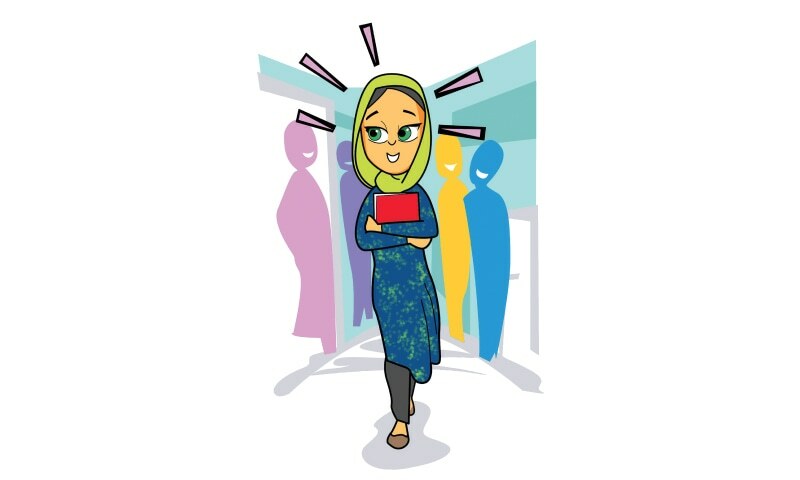 Have you ever wondered why you take an instant liking to a new teacher if she enters the classroom with a smile on her face? Often we have to go to a party or wedding where we know very few people. On entering the venue, as we look around for a seat, we are instinctively drawn to a person with a smiling demeanour. We are more comfortable with a doctor who wears a smile on his face. Remember that a smile has a magnetic and endearing power. It is also highly infectious and has the power to cheer up people around us. Learn to smile even if you don’t feel like doing so. All of us have problems, but wearing a sulking look will not solve them in anyway. People who have a smiling face are definitely more popular than those who habitually wear a frown. Helping out people around us is a very endearing habit. You may help a classmate in subjects he/she finds difficult, help your mum by sharing her workload, take care of your younger siblings or run an errand for your grandparents or an elderly neighbour. You may be better than your parents or grandparents at computers, tabs or cellphones. Never complain if they ask for your help repeatedly. Consideration for others with a quick helping hand is a simple quality which makes one popular. Speak lovingly with your younger siblings and cousins, and be kind to them. Take interest in their activities in order to show how much you care for them. you. Help them out whenever you possibly can. Give away your extra toys, clothes and books to the needy people around you. They will be more than grateful for your compassion. Remember that kindness always pays back positively. At first thought you may feel that this tip is not related to popularity. But in my opinion, a person looking fresh and neatly dressed is always better liked than those who do not care about their personal hygiene. We usually shun people who smell of perspiration, have a foul breath or are generally untidy. Keep your nails trimmed neatly and hair properly brushed. Shower daily, brush your teeth twice a day and be sure to use a deodorant when going out. You do not have to spend a lot on these things; only adopting healthy habits will make you well-groomed and attractive to others. Try out these simple and easy tips to be better liked in your circle. I am sure you will find your graph of popularity rise in no time. All of us want to be popular among our peers, relatives, teachers and all the people around us. But often we see that some children are more popular than others. Friends and relatives are attracted to them, teachers have a soft corner for them and peers respect them (however grudgingly). Have you ever tried to find out what qualities endear these children to everyone? It is their good manners, their etiquette or behaviour and consideration for the feelings of others which gives them this popularity. Here are some important ways to win the hearts of friends and relatives. Always remember to say `Please` and `Thank you`. When you are asking for something, if you say please, even if it is a small favour, it appears that you are making a request rather than a demand. 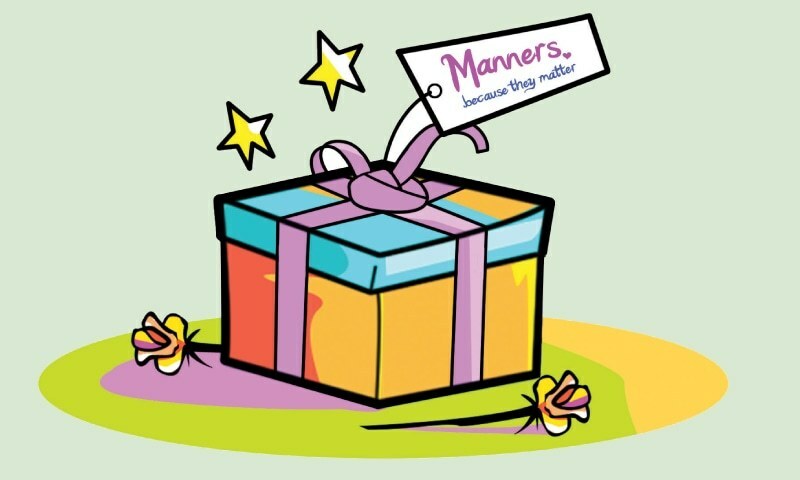 In the same way, when you receive a gift, when someone gives you a compliment or even when someone steps aside to let you pass, saying thanks is an important rule of good manners. It shows that you are grateful for the gift, compliment and consideration, and you appreciate the person who has given it to you. It also shows courtesy on your behalf. Never forget to say `Sorry`. Although some children may find saying `sorry` quite difficult, it is a basic aspect of good manners and a quality which will quickly endear you to everyone. If you have hurt someone (physically or emotionally), forgot to fulfil a promise, or misbehaved with an elder, `sorry` is the magic word which wipes out all ill feelings. When you are in a public place, it may be a doctor`s waiting room, a supermarket or a restaurant, show your respect for your elders by opening doors for them and offering them your seat if there is no place for them to sit. Most of us are too busy in our lives to pay attention to old people and we seem to forget that they often feel lonely. A kind word to them, enquiring about their health (or any other problem) and even listening to them attentively would brighten up their day and will go a far way in winning their hearts. Never let a discussion turn into a quarrel. We all have different opinions on every matter and the rule to remember is that everyone has a right to his/her own opinion. Often we see an argument turn into a heated debate. Wait for your turn when you are having a discussion and do not try to raise your voice over others to get your point through. It is healthy to argue with friends and peers but the discussion should be polite and informative. Do not forget that difference in views is sometimes due to the diversity of race, traditions or religion. Show your respect to the other one`s views even if you do not agree with him/her. An important rule of good manners is never to interrupt someone when he/she is speaking. A patient listener is more liked than an ardent speaker. Especially when someone older than you is talking to you, listen attentively and answer politely. Be courteous to your elders and treat them with respect. Even if you are irritated, never speak rudely to anyone. Remember that a smiling face is more popular than one with a frown. Always be ready to help. You may be better at some subjects in school, so helping out your class fellows if they are having difficulties, would make you a well liked peer. Whenever it is possible, offer a helping hand to your elders. Carrying a load for someone in a supermarket, helping an old person to cross the road, or lending a helping hand to your mother in house hold chores, are gestures which show that you care and would definitely endear you to their hearts. Be a good sport. Some children tend to turn nasty if they lose a game. Remember that there always has to be a winner and a loser in a game. If you win, do not boast or degrade your opponent. And if you lose, do not sulk; accept your defeat graciously and congratulate your opponent open heartedly. The time you spent enjoying the game should be more important than the fact that you won or lost it. 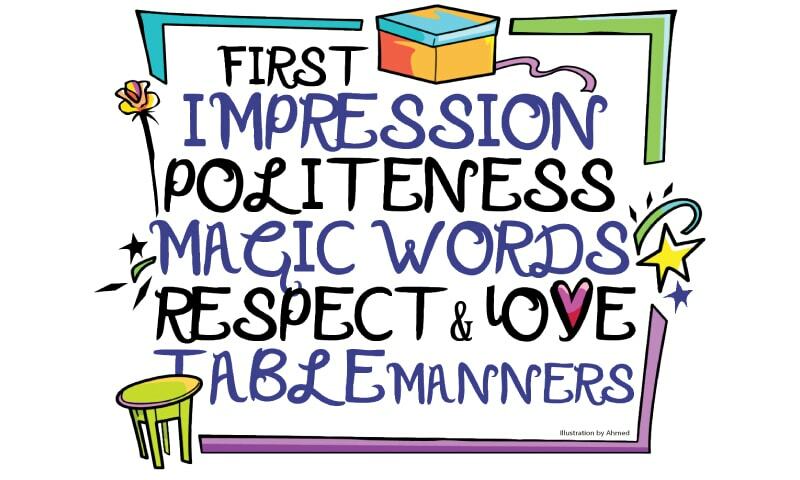 Good manners, consideration for the people around us and proper etiquette of behaviour indicate a good upbringing and are a mark of a respectable social background. So mind your manners and happily watch the graph of your popularity rise! The list of do’s and dont’s is never ending, but the above mentioned are only a few tips to guide you how to endear yourself to the people around you. Good luck!